Wow, Calgary! That was an incredible evening! Our crew of athletes, musicians, chefs, judges, technicians and volunteers can create an amazing event but it only really soars when the guests bring their own high-octane energy and enthusiasm. Then things start to rock! That’s what happened last night in Calgary. The Kitchen Party whacked it out of the park. George Stroumboulopoulos was our emcee, keeping everything humming along like clockwork, the crowd hanging on his every word as he introduced over 40 local and nationally based elite athletes from the professional, para- and Olympian worlds, including Simon Whitfield, Melisa Hollingsworth, Cindy Klassen, Curt Harnett, Colin Patterson, Mark Arendz… There were so many medals up on that stage! And our second pillar – music – took the event to a new level. A brilliant line-up was led by Jim Cuddy, Barney Bentall and Danny Michel, with the awe-inspiring Bill Henderson from Chilliwak bringing the entire crowd to its feet, and Anne Lindsay on violin keeping them there, very ably abetted by Devin Cuddy and Sam Polley, with Geoff Hicks and Rob Becker on drums and bass. The new emphasis on music has electrified our evenings and people love it! But none of this (and here I will admit to a certain bias) could eclipse the culinary side of things. This was the strongest showing of the campaign in terms of gastronomical imagination and quality of execution. Opinion about who should win gold and who silver was divided among the judges but after much discussion we reached a consensus. Who were these judges, you ask? It was a high-powered group led, as ever, by our Senior Judge for Calgary, author, teacher, restaurant critic, broadcaster, John Gilchrist. Judging with us was chef, culinary instructor and television star Michael Allemeier; writer, traveller, editor and publisher of City Palate, Kathy Richardier; former Canadian Culinary Champion Chef Ryan O’Flynn of The Guild; another former Canadian Culinary Champion, Chef Jinhee Lee of Foreign Concept; and last year’s gold-medal winner, Chef Blake Flann. There was also a close fight for bronze with Chef J P Pedhirney of Bridgette Bar just pipped at the post by Roy Oh of Anju. 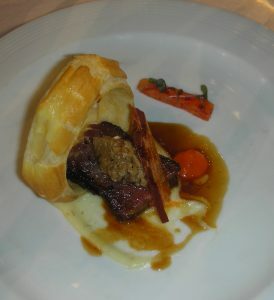 Chef Oh gave us a “deconstructed Korean beef Wellington” of wagyu short rib that he grilled, marinated in sweet soy, then cooked sous vide for 48 hours until it had that almost gelatinous texture that Cantonese beef dishes often acquire and tasted a little like char siu. 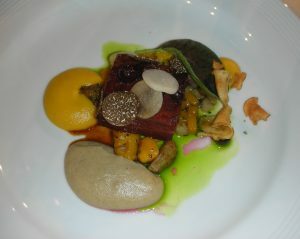 On top of the delectable meat was a quenelle of king oyster mushroom enriched with foie gras. A hoop of buttery puff pastry stood upright in a mound of pommes aligot flavoured with gruyère, buffalo mozzarella and shaved white alba truffles. A dot of carrot purée added more sweetness while a brittle shard of smoked truffle-scented bacon brought crunch to the dish. Chef added beef jus and emphasized the Korean interpretation with a small, crunchy wand of daikon kimchi that carried real chili heat. It was a great dish and Chef Oh boldly decided to pair it with a white wine, not a red, choosing the oak-kissed 2017 Chardonnay from Upper Bench on the Naramata Bench in BC. Chef Matthew Batey of the Teatro Group (a past gold medallist) won the silver medal with a dish he called “Two Oceans, One Prairie & a Valley” and served in a broad bowl. 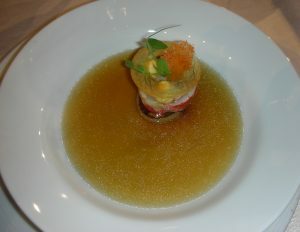 All the components of his dish were set on top of each other to form a multi-layered pillar, then Chef poured on a piping hot consommé made of pork bones and lobster shells. At the base of the pillar was a tender and delectably flavourful braised pork cheek, subtly scented with vanilla and set inside a ring of juicy poached honeycrisp apple from the Okanagan. A touch of creamed corn gel separated this from the second protein, a roulade of Nova Scotian lobster, cooked so rare it almost trembled, glazed with Chardonnay and wrapped around tiny amounts of tarragon and squash. A dab of sturgeon caviar and three more dots of Taber corn gel had been piped onto the lobster and they supported a translucent potato crisp shaped like a hollow circle. A second crisp was set in the hole of the first, this one like a fragment of an orange veil and made from the lobster’s roe. The dish was lightly seasoned with Vancouver Island salt, representing the second ocean in its title. The textures were so refined, the details so harmonious that we judges were completely seduced, as we were by Chef’s wine match, the subtly complex 2014 “Queen Taken” Chardonnay from CheckMate winery in the Okanagan. We awarded our gold medal to Chef Dave Bohati of Murrietta’s, who has also won gold with us before. He chose to work with Brant Lake wagyu beef cheek, first brining it like pastrami for 72 hours then smoking it, crusting it, slow-cooking it sous vide and finally braising it. The result was astonishingly tender meat that fell apart at the touch of a fork, subtly flavoured with sweet smoke and spices. Chef paired it with four different preparations of Jerusalem artichoke – a rich purée, small roasted nuggets of the root, crunchy crisps and dime-sized slices of raw sunchoke that he briefly acidulated and vacuum-packed to keep them fresh and firm. Kabocha squash was the other major ingredient, used as a second purée, as a tender brunoise and also to make lovely little gnocchi, finished in a sauté pan with some roasted bone marrow and shaved fresh Burgundy truffles. Saskatoon berries served as a condiment, macerated in Chef’s chosen Pinot Noir but still whole and juicy. A little green herb oil was the finishing touch, bringing colour to the plate. That Pinot Noir, the 2016 Tantalus from Kelowna, BC, was an inspired choice made, Chef Bohati explained, because of the wine’s peppery notes and unusually high alcohol. 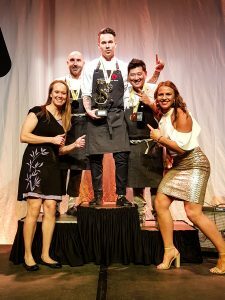 So Dave Bohati will return to Kelowna in February to compete in the Championships while the Kitchen Party team, still exultant after the triumph of Calgary, prepares for our final event next week in Winnipeg.